A Sneaky Lululemon Upload today!! Last weeks Lululemon Upload, All Days Vest Fit Review, Fit Review Ready To Rulu Pant, Get Set LS, Store Photos. Thank goodness for an early sneaky upload! I have the kids Halloween parade tomorrow and various other Halloween plans so this works out great as I’m sure it does for many of you! Hopefully you got my heads-up email that there was an upload. I know I said I was on Ban Island for Lululemon leggings but I really need to try these Rip Wave Embossed Wunder Under Pants and I also ordered the Fleece & Thank You Pullover in the light grey. How cute is the Wool Be Toasty Toque!! I have a version of the On The Go Poncho from a few years ago and really love it. The zipper is so edgy on the black one. I wonder if the material at the zip is the same faux leather look that my black one has. Loving the Teal, Mint and Hydrangea Rest Less Pullovers! Did you notice the Meant To Move Pant, it’s made of Vitasea which lululemon hasn’t used in several years now. Lululemon used to use Vitasea in most of their cotton tees and LS’s. Vitasea is a really nicely weighted pima cotton jersey with a ton of stretch and really beautiful drape. I hope they use it more this year. I was going to post more Guest Fit Reviews today that Mrs. O has sent me but I think I’m going to post those (hopefully) at some point tomorrow, if not it will go up early Wednesday. Stay tuned!! I have the Down For A Run Jacket and Down For A Run Pullover from a few years ago and love them. I have the pullover in green and black swan and just love them with the contrasting rose gold zipper. I’m glad to see it’s back and can’t wait to see what fun colors it comes in this year. The Full Freedom Crop seems to be a new version of the aligns, but with a strange ‘long but’ waist. I much prefer the standard waists on the Align Pants but this may flatter certain body types that the Align Pant waist does not. I’m glad this festival bag was uploaded today. It was early released at the Vancouver flagship store on Friday and it was already being flipped for double the price on resale sites. "Fit Review: All Days Vest"
"New In Store! 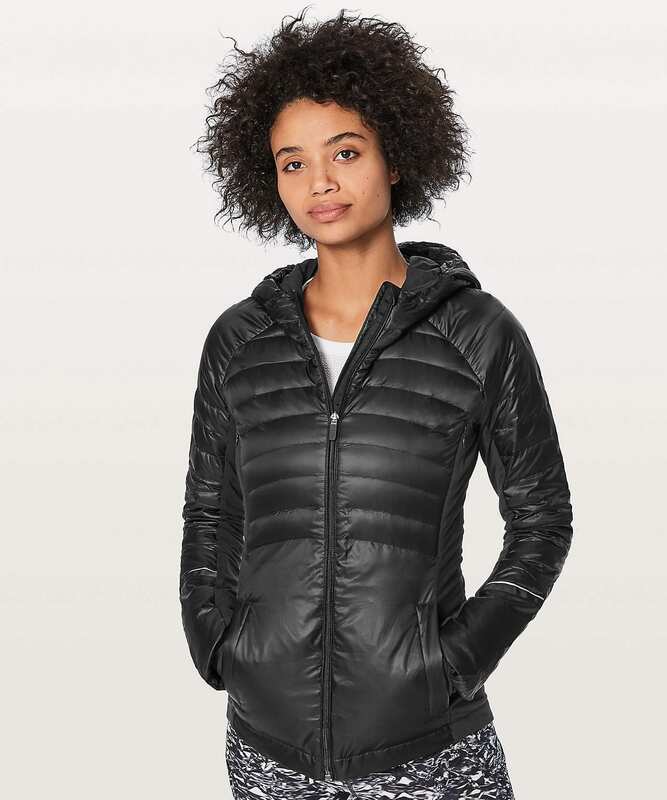 Lululemon Accessories and Front And Centre Jacket"
For some reason all the prices are in USD on the Canadian website. Weird. I’m on Canadian side and they are all in CAD…maybe your browser? Got it fixed. Thank you. There’s a 28” align pant on the US side. I have been wishing for these for months! The other thing I think would be cool are align shorts with like a 4” inseam. For the tall ladies there are 31” inseam Wunder Unders in luon too. Not only longer, but they have them in camo! All of my Lululemon dreams just came true. Hi! Do you have any idea what the black lace up boots are in the photo with the new camo aligns?! I posted an image link at the bottom of the post of them. You may want to brace yourself before you look at the price. If you aren’t seeing it, refresh your browser. Oh my! Yikes! I loved those, too!!! Gravity Pope in Vancouver and Calgary carries this brand but not this shoe. I think this she was from last year. The US Site has inspire crops WITH MESH. NEW today 🙂 🙂 !!! Where were they last night when the 20% voucher expired. LLM, Mrs O, ladies….looking for opinions and insight into the difference between skinny wills and skinny grooves. Should I continue my search for the prior? Any help is greatly appreciated. Thank you. Skinny wills have pockets and a drawstring at the waist (I think). Skinny grooves have neither. I LOVE skinny grooves and am thrilled to see them back. They are super flattering and a nice option when you don’t want your ankles exposed to the cold. I wear them a bunch casually! I agree with this assessment. I like the skinny groves better. Hi Mrs O…do u think they will release these in something like coco pique? Why couldn’t this stuff come before coupon expiry ? Yes, the Skinny Wills had pockets and a drawstring that tied on the outside. You could flip the waistband down to adjust the rise. They are nice pants and I liked how they slouched at my ankles (I’m short). I ended up only wearing them once and sold them a few months ago to my friend for her daughter. I would advise trying the Skinny Grooves that just came out. You really can’t beat buying directly from Lulu. Aww Slush Hour jacket looks so cute and right up my alley! But not for $248?? Aww that Slush Hour jacket is so cute and right up my alley!! But not for $248? I’m curious about that, too. I wanted, but didn’t buy, the Clear Mint one, because I’m afraid it’s going to be really sheer. I actually tried it on in store today (posted picture and review on my Facebook page but I will post here as well tomorrow). The teal blue was tight and slightly shinny and not as soft while the clear mint was more like last years, soft and stretchy and matte. It wasn’t so sheer that it showed the black contrasting on my bra underneath. I purchased the mint because I really loved the quality of it and the color was fun. The teal is the color I would have gravitated to but the quality was definitely lacking on that one. If you don’t mind a slightly snugger fit or the sheen to the color than it would be fine, I just preferred the mint one. Slush Hour jacket is so cute and right up my alley . But not for $248? This was a good upload! And lots of classics are back (inspires, and clear mint!). I agree! I picked up Black Cherry Skinny Grooves, Nile Blue Rest Less PO, and the Everywhere Kit. I would have loved the poncho a month ago, but the weather has turned where I live. Seriously considering going back for full length Aligns and another Rest Less PO. Neither of which I need. But *wanting* things from LLL is a nice, nostalgic feeling! Very happy about the return of the classics and very happy about the colors they’re offering. Got my order. Very happy with the Nile Blue Rest Less PO and the Black Cherry Skinny Grooves. The Everywhere Kit is attractive, but I don’t think it’s worth the money. I think it’s gonna go back. That new blue inspire tight is gorgeous! I’m loving the poncho, the camo full freedom jacket, the mineralize festival bag, fleece & thank you jacket and the camo aligns. Of course all of this stuff gets uploaded after the coupon expires. Is anyone else having an issue viewing this blog on mobile? I have to clear my cache/cookies everytime because a spam pop-up ad won’t let me view anything else on my phone. The jumping around should only be happening during the upload post because I am constantly editing the post live during the upload so it has trouble caching. Once the last edit has been made and the latest version caches it should stop. I’ll contact my site server to see if there is anything they can do. The other issue with mobile is I had a beta google ad loaded on to my page which interfered with posts. I’ve now switched that off so it shouldn’t cause issues. I’m sorry, I changed my site format because my site was loading incredibly slowly which was frustrating readers, and it seems like I traded in one set of problems for another set of problems. Yes, I was having major scroll lag yesterday, it kept shunting me back to home page and I’d lose my place on the page, and the top banner/massive nav bar keeps getting in the way.I really hate that you have to scroll down so far before you actually see ‘what’s new’ on the ‘what’s new page’. Same here! The pages/pictures seem to take forever to load. Also, I think the product pictures are closer to the edge of the page? It seems now when I scroll, I end up clicking on a product by accident and then have to start the scrolling from the top of the page once I hit the back button. It’s so annoying!! Do you mean on the lululemon site or my site? On the new LLL site, the thumbnails are very close to the edge of the page. It’s a lot of scrolling. Don’t they beta test the site anymore? It’s got a lot of annoying features. They did fix some things: search by color/print, and more product info. But there’s a lot of annoying stuff going on. I wish they’d bring back the old “red” one from two incarnations ago. It also had challenges, but it was the best of the bunch. The new LLL site is really frustrating. I’m having the same issues and sometimes things double up or change sizes when I put things in the cart. Be sure to double check everything before you click purchase. Good upload too and I didn’t cave, so I might be ok through this saving thing. Anyone else not able to find the align ii camo print? Has it sold out already? I was disappointed too. I’m betting they either re-release them soon or we’ll see them pop up in the regular 7/8 length within a week or two. Camo prints are good sellers, surely they’ll stock more.